First determine how you want to use your cabin. If it will be used to just store your lawn mower and gardening tools, there is no point in making a particularly large investment. The more free time you want to spend in the garden house, the more attention you should be pay to the thickness of the walls, the quality of the windows and doors, as well as the space in the building. 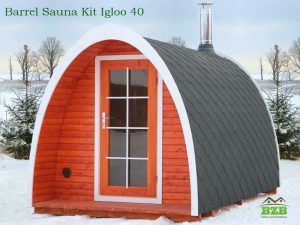 It is worth considering whether the future garden house will be a guest accommodation, a shelter for summer events, a home office or just a room where skis and tools can be placed. It is always wise to ask the opinions and wishes of all family members, and to find the right size to have enough space for hobbies and other activities. The garden house is an investment that will last for years. The most common wall thicknesses for garden houses are 1-1/8” (28 mm), 1-3/8” (34 mm), 1-3/4” (44 mm) and 2-3/4” (70 mm). 1-1/8” (28 mm) wall logs are usually one groove and one tong profile logs. 1-1/8” (28 mm) walls are strong enough to withstand garden sheds and small garden houses (up to 100 SQF) in size. Thinner wall log structures are also more affordable. For medium-sized (100 Sq.Ft. to 250 Sq.Ft.) summer houses, cabins, saunas and garden studios, the most common wall log thicknesses are 1-3/8” (34mm) and 1-3/4” (44mm). The 1-3/8” (34 mm) and 1-3/4” (44 mm) wall logs have double tong and grooves. Compared to 1-1/8” (28 mm) wall thickness, these walls are not only stronger, but also more heat and cold resistant. 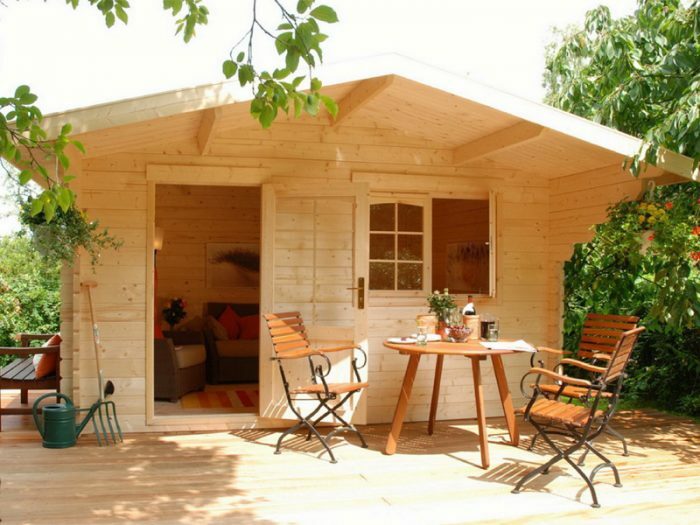 Briefly, for garden sheds and seasonal, small (40-100 Sq.Ft) garden houses, you can confine yourself to a 1-1/8” wall log structure, but for any garden house larger than 100 Sq.Ft, it is recommended you choose a wall thickness of 1-3/8” (34 mm) and thicker, especially if you want to use the house year-round, and intend to add insulation. Single pane window or double pane window? If you are planning to buy a garden house for seasonal use, you can choose a structure with thinner walls and a single pane doors and windows. 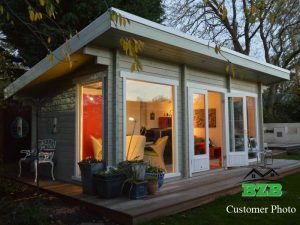 Single-glazed garden studios are cheaper, and in general it is not possible to install double pane windows for garden houses with 1-1/8” (28 mm) and 1-3/8” (34 mm) wall thickness. Because thinner walls have low thermal insulation, installing or adding double pane windows would be unreasonable expense. If you want to use your garden house all year round, dual pane windows are necessary. In most cases, single-glazed windows are available in garden houses with a wall thickness up to 1-3/4” (44 mm), and from 1-3/4” (44 mm) wall thickness, double pane windows are standard in the house. For year-round use, we recommend to buy a garden house with at least 1-3/4” (44 mm) wall thickness, and a dual pane door and windows package. It may also make sense to insulate the floor and the roof as about 35-40% of the heat leaks out of the roof, and the uninsulated floor is the main point of entry for cold air. For cooler periods, an electric radiator or blower is well suited. Walls can be also insulated, but since there is no space for insulation, new framing needs to be added and walls finished again- all this will require more work and add cost to your project. We always suggest that you use your cabin first and see if wall insulation is even required. The space is relatively small and it can be easily heated up or cooled down. After deciding on a cabin, you might need to get a building permit. Requirements for permits vary from town to town, state to state. Please contact your town’s building department, usually in your local government building, for a building permit, information on codes and foundation requirements. This information and the codes that govern your area can change without notice, so please ensure yours is current before you begin to build. You must confirm that the merchandise will meet these local codes and guidelines PRIOR TO PURCHASE. The garden house can be installed on almost any kind of surface – but it is important to choose the best foundation option. The right foundation is crucial for any cabin or sauna structure. Regardless of the type of foundation, only a uniform base ensures the stability and durability of the garden house. It is not possible to build walls on the unleveled foundation, nor will the doors and windows work properly. Crushed Stone pad with Concrete Blocks and Pressure-treated Lumber. The appropriate foundation type depends mainly on the size of the garden house, the property surface and the purpose of the cabin. Options 1 and 2 are the ones chosen most often by our customers and are well suited for smaller and medium- sized garden houses. Choosing one of these bases is also the most affordable option. A concrete slab is the strongest, but it requires specific knowledge to build. Also, special machinery and equipment might be needed, so it is advisable to use a professional service if you choose this option. Do you handle installation yourself, or hire a professional to do it for you? The time needed to install a garden house depends, of course, on the size of the garden house – a smaller house can be assembled in just a few days. The garden house can also be erected by a person who is not involved in the construction on a daily basis. Based on our experience, nine out of ten customers can do their own assembly. We always recommend at least two adults to handle assembly; you will also need some basic tools (hammer, saw, battery drill, screwdriver, tape measure, ladder, knife and water level). If you don’t have time or you feel you don’t have the skill, you can always hire a local handyman or a contractor. Each kit comes with installation instructions for a specific building. And finally, you or your contractor can always call BZB and ask for help. Welcome to BZB Cabins & Outdoors blog. Our company is a proud distributor of high-quality, eco-friendly log structures and garden products that are manufactured in Europe.